Beer Pong is a popular drinking game that is played around the world and is also known by the name of Beirut. The game consists of two opposing teams, the players of which attempt to throw a ping pong ball across the table with a view to ensuring it lands in a cup of beer on the other side. Beer pong is popular in wide range of venues such as bars, colleges, universities as well as house parties. It is thought to have evolved from similar games played at the fraternities of the Ivy League Dartmouth college in Hanover, New Hampshire. Here, the game began actually using bats and a net and resembled table tennis, but over time the game has become simpler and the use of bats or paddles has ceased. 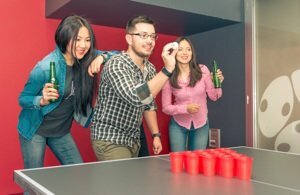 Because Beer Pong is a fun and informal drinking game, no official body or organisation exists to oversee the game and its rules, however there is a World Series of Beer Pong. It remains a popular game that requires a surprising amount of skill as well as a dash of luck, but because the game traditionally involves the use of alcohol, it should only be played by players who are of legal drinking age where the game is played. The object of Beer Pong is for one team to win the game by successfully eliminating all of their opponent's cups. As this is a game that nearly always combines alcohol and students, then getting drunk is often seen by many as being the other object of the game. Because the better you are at the game, the less you end up drinking, it is not unusual for some players to be deliberately bad at the game to ensure that they get more alcohol. Four people play in a Beer Pong match, two on each team, although it can be played in a one-on-one format. In terms of equipment, all that is really needed to play Beer Pong is a suitable table, some cups and a ping pong ball. Most commonly, disposable plastic cups are used and then each team places their cups (usually numbering 10 or 15) in an equilateral triangle on their side of the table, all filled with the same amount of beer. Another cup may also be used to rinse the ball between throws. There are no stipulations as to the type of beer that should be used, but the ABV usually rests between 3% and 5%. Other drinks can be used such as spirits or even water if players want to play an alcohol free version of the game. In Beer Pong, a points score isn’t kept the same way as in other games such as Hockey or Soccer. However, there is a form of scoring system. Because both teams start with 10 or 15 cups, it is possible to see who is in the lead in the game, the team who has the most cups being in front, with each time trying to reduce the other team’s score to zero as quickly as possible. The game is won when one team successfully eliminates all of their opposition's cups. A draw can occur when both teams are left with one cup, and both eliminate their opposition's cup on their final turn. If this occurs, the usual way to decide a winner is to have overtime, where three cups are used and the first team to eliminate the opposition's cups being declared the winner, with continuing rounds of overtime being played if necessary. If a team completely whitewashes their opponent and eliminates all of their opponents cups whilst not losing any of their own, this is called a shutout. If this occurs, the winning team are allowed to tell the losing team to do a dare and the losing team must perform it. This can often be something embarrassing such as running outside naked or downing a large amount of alcohol. Once the teams have been arranged, the team to go first must be decided. This can be done in several ways but is usually done by a coin toss or a quick game of ‘Rock, Paper, Scissors’. An equilateral triangle of cups (10 or 15) is arranged in front of each team and an agreed amount of beer (or other alcoholic drink) is placed in each cup. Each team will also have another cup for personal use to rinse the ping pong ball. The team to go first then each throws a ping pong ball towards their opponents cups. If one or both of the balls successfully land in an opposition team member’s cup, then an opposition team member must drink the contents of that cup and the cup is then removed from play. The teams continue to take turns until the one team has eliminated all of the opposition team’s cups. Should both teams eliminate their opposition's final cup on their final turn, then the game is tied. In this instance, 3 cups are re racked and overtime begins, the winner being the first to eliminate all of the opposition's cups. Further rounds of overtime will take place if further draws take place until a clear winner is found. Shooting in Beer Pong may be done either underarm or overarm and the player may try and bounce the ball into the cup or throw it in directly. Care should always be taken when playing Beer Pong and all players should drink responsibly.